There are so many things that make diamond jewellery gifts perfect for the festive season: their bright sparkle harbouring a scintillating fire within; the way they light up your significant other’s eyes when they open the beautifully wrapped jewellery box, and the bright shimmer with which they embellish their hand, wrist or neckline. Adorning a wife, fiancé, girlfriend or someone special with jewellery is a time-honoured tradition, and there is perhaps no better time to spoil someone with a precious tanzanite or diamond gift than the festive season. We invite you to view our exquisite Christmas jewellery gifts. Our diamond holiday gifts guide has an array of desirable shimmering creations – from the Rose Gold Cushion Solitaire to the breathtakingly beautiful Tanzanite Cross Pendant – one of our most striking tanzanite Christmas gifts. Regardless of your significant other’s preferences and personal style, we have something spellbindingly beautiful that will put a twinkle in their eye this festive season. With the festive season around the corner and the joy of being with your significant other, the holidays are one of the most romantic times of the year. Hence, it’s the perfect occasion to get engaged; and there are so many amazing ways to propose during Christmas. 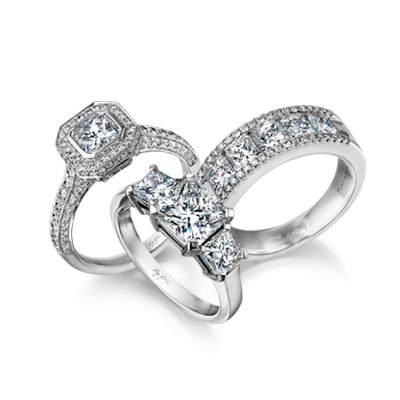 If you are planning on getting down on one knee this December you need the perfect Christmas engagement ring. Shimansky’s Rose Gold Cushion Solitaire diamond ring with micro set diamonds on the metal of the ring is a magnificent choice. The diamond ring shown, beautifully crafted in 18K rose gold, contains a 0.70ct cushion cut diamond in a claw setting with round brilliant cut micro set diamonds on the metal to add extra shimmer. This design is customisable and can be tailored to your taste and preferences, from 0.30ct to 5.00ct, in any finger size and in platinum, 18K white-, yellow- or rose gold. Whether you are planning a holiday engagement or simply want to surprise the special lady in your life with a beautiful diamond ring gift, our Rose Gold Cushion Solitaire is an outstanding choice. Celebrate the time-honoured tradition of holiday gifting in style by adorning your loved one with diamonds for Christmas. Shimansky’s contemporary-classic Millennium earrings, expertly set with two perfectly matched round brilliant cut diamonds weighing 1.42ct in total, make for a timeless gift. The moment her eyes light up when she opens the jewellery box will be etched in your memory forever. The pair shown is set in 18K white gold, however, they can be specially created based on your specifications in platinum, yellow- or rose gold. There isn’t an occasion when an exquisite tanzanite jewellery creation does not make for the perfect gift. The Tanzanite Cross Pendant is a particularly meaningful Christmas present and a beautiful way to capture the festive spirit. The pendant shown contains six square emerald-cut tanzanite with a semi-tube setting in 18K white gold totalling 7.20ct. When it comes to tanzanite Christmas gifts, a creation from Shimansky’s Ayanda Tanzanite collection is a superb choice as these pieces are certified in accordance with Tanzanite International Grading Standards. Make this Christmas one she’ll always remember by putting a Shimansky Tennis Bracelet under the tree or in her stocking. The bracelet shown contains claw-set diamonds in Shimansky’s patented My Girl diamond cut, weighing 5.58ct in total. Of all the diamond gifts in our collection, this sparkling creation is one of the most exquisite jewellery items, making it a Christmas jewellery gift with everlasting beauty that she will treasure forever. The My Girl diamond bracelet gift is available in 18K gold and can be especially created based on your specifications with hand-selected My Girl diamonds exclusive to Shimansky. If you are in search of a classic and stylish Christmas jewellery gift for the man in your life, consider spoiling him with a Shimansky creation. A Shimansky jewellery creation lives forever, making it the perfect gift to remind you of this joyous occasion for years to come. The Evolym men's cuff is essential to a well-dressed man’s wardrobe. The cuff shown carries the distinct design of the Evolym collection featuring clean design lines and an elegant curve to create a refined look that complements both casual and business wear. Handmade in sterling silver, the Evolym cuff measures 11mm wide – it’s a strong, masculine and distinct design perfect to enhance your man’s sophistication and style. To add a special touch to this timeless Christmas jewellery gift you can add a personalised engraving. Christmas is in the middle of the wedding season. If you are getting married during this romantic time of the year, now is the perfect opportunity to find a wedding ring that will symbolise your love and capture the essence of this meaningful moment forever. The Shimansky Max-Line men’s wedding ring collection features an array of unique designs set with or without diamonds. Crafted in the finest palladium, a naturally strong white metal, Shimansky Max-line wedding rings are hard-wearing and made to stand the test of time. Shimansky’s diamond gifts and tanzanite gifts are created to celebrate life’s most meaningful occasions. What better time than the festive season to show your love for someone special with the gift of a unique Shimansky jewellery creation? Whether it’s for your fiancé, wife, mother or best friend, giving someone you love diamond jewellery gifts for Christmas makes for an unforgettable moment. We invite you to visit a Shimansky showroom near you before and during the festive season to view the beautiful creations in our Christmas jewellery gift guide, as well as the rest of our signature designs. Alternatively, for prompt assistance with any query, you may have, please contact us on WhatsApp.